Day 23: Which Artificial Sweeteners Are Best? 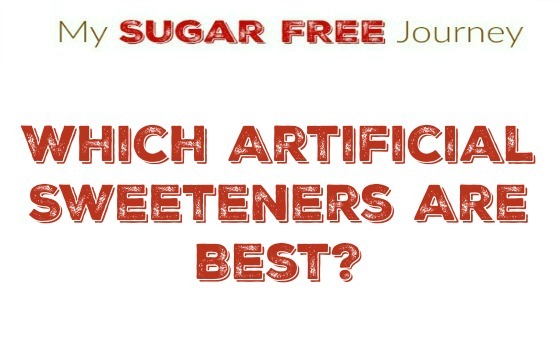 Which Artificial Sweeteners Are Best? One of the most common questions I get when I explain how and why I eat is “What artificial sweeteners should I use?” The answer to this couldn’t be easier. None of them. Once you start removing sugar from your diet, you are going to find that your “sweet tooth” becomes less and less important and you are going to want less “sweet” in your foods and drinks. This is a good thing and something you should really watch out for as you continue along your sugar free journey. However, you are probably still going to want an occasional dessert or sweetened drink so here is what you need to know about the different sweeteners. Stevia is an herb, which is commonly known as “sugar leaf” and has only been approved for use in the last few years. From all reports there are few side effects and as a personal note, has become my sweetener of choice. Watch out for the powdered varieties though as they are typically mixed with maltodextrin which can cause an insulin reaction. Derived from chicory root, it has a natural taste very close to sugar. It can caramelize like sugar and has very little aftertaste. Some will mix it with a sugar alcohol to make it a little sweeter so less is needed. Some studies suggest we can absorb a small amount so it may cause a small insulin reaction but nothing is conclusive. Also called Luo Han Guo, is native to China and has been used as an herbal remedy for obesity. The biggest drawback is it is very expensive compared to other sweeteners. Most commonly used sugar alcohol because it is similar in taste to sugar and very cheap. Will cause more of an insulin reaction than the other alcohols so it’s better to avoid it. Recent studies suggest than when used in powdered form, it may cause a larger insulin reaction than sugar which means definitely avoid it. If you can find it in liquid form, it is 600x sweeter than sugar and does not appear to cause an insulin reaction at all. The most controversial sugar substitute as it has been linked to a whole host of neurological problems. If even 10% of what has been said about it is true, I would avoid it like the plague. The first synthetic sweetener and has been in use for about 150 years. Appears to be relatively safe and doesn’t cause an insulin reaction. While you will never buy Ace K for home use, it is widely used in diet soft drinks. It causes a small insulin reaction and may be the reason why it is so difficult to lose weight while drinking diet soft drinks. PREVIOUS POST Previous post: 1/26 Weightloss Wednesday: Another Week of Weight Loss! I just know that sugar really harms your body if you take or use it a lot.